How easily we fall out of shape. Today’s ride of 22 miles felt tough. I was back to equalling the slow times of last winter. I remember at one point thinking this was a long ride – when was the last time I felt that, the 300k? 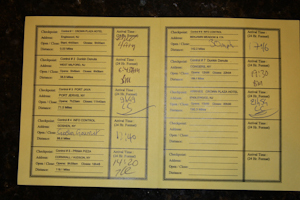 As I said after the 600k, I need to get a schedule as that worked very well when I had planned out the rides in advance. Of course, having to train for the 5k run is not helping as I have to now alternate between running and cycling. After the turtle run, if I am still not liking it, I may switch to swimming instead of running. The new saddle popped. I was climbing the hill on Motor Parkway when I felt it pop. What had actually happened was the force on the saddle made it snap back on the post somehow. I need to go have a look as I forgot when I got in. I got to the top of the hill and popped it back as it was uncomfortable climbing with the saddle leaning slightly upwards. It did a mini pop later into the ride but I haven’t popped that back yet. Let me go do that now. I am actually doing some cross training! And it is running, of all things. The last time I ran, apart from for a bus, was probably back at school when we were forced to do cross country which I hated. Anyway, I promised Alma that I would do a 5k with her after she has supported me throughout all the weekends in New Jersey. The 5k is on October 23rd so we have began training. We did our first run on Sunday and again this morning. We are just running 2.25 miles which incorporates two loops of the park – next week we increase the number of loops. It is not too bad, if the truth be told. I have been concerned about my knee which I damaged playing football/soccer back in England. After running the first half mile, the initial shock tends to disappear. I found I actually like running up hills. Go figure! The new saddle arrived on Friday afternoon and today was the first chance I got for having a ride having been scuba diving and running both Saturday and Sunday respectively. When I sat on the bicycle in the garage last night, my immediate thought was that it felt uncomfortable. I knew I was going to take it out for a spin this morning so when I woke up, I prayed it was raining!! No such luck. So armed with lights and sporting the cycling jersey got me, luminous yellow, I set off. The thoughts for this morning were different to last night. A lot less cushioning than the other saddle, however, not as severe as the saddle I got on my first racer when I was 13. My bum quickly adapted to it though I can tell it is built for speed work. 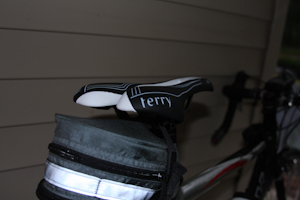 Terry also make saddles for long distance, especially designed for men and their bits! I may end up getting one of those. The saddle became more comfortable as the ride progressed. Or, I should say, my bum moulded itself to it better. I end up liking the saddle and think it will be a good saddle for the winter when the rides are not so long. I am not sure about doing a century ride on it though you never know, come March next year it may feel as comfortable as any cushioned saddle. This is to be my last big ride of the year, supposedly. And with the completion of it, I earn the achievement of having done a Super Randonneur series in 2010. This was to be a hilly ride and there is not much scope for hill training on Long Island so I was interested in seeing how I would cope. Water. The ride started at 4am and I made sure I had my water bottle and camelbak. With the frame bag, I can no longer use the rear water bottle holder as demonstrated on the 600k when a water bottle came flying out after hitting the first pot hole in the dark. My regular camelbak as used on the 400k was too heavy and I got back ache from that. So this time, I was using Alma’s smaller pack. I also learned on the 600k that having both the water bottle and the camelbak filled with sweetened drinks was too much; I was going to keep pure water in the water bottle. It was nice having fresh water available. Lights. I have three rear lights. I was inspired by others on the 600k and I like the fact that I can be seen from the next county. On the 600k, I had a solitary light and that was coming to the end of battery life on the first section. Fortunately the 7-11, or Wawa, whatever it was, had triple-A batteries and that Leroy, the NJ RBA, could get my rear light working again. I would only be cycling for a couple of hours before dawn on the 300k and I was hoping to be back before night fell so there wouldn’t be much need for the lights but it is always best to be prepared. GPS/Cue Sheet. As always, I mainly rely on the Garmin for the route, especially at night. When setting up the route on MapMyRide, I always make sure that the controles are actually visible using Google’s streetview. That way I know that I am definitely in the right place. The last map I created from home had the route finishing as soon as I left the driveway so I was hoping that the 300k route would be issue free. 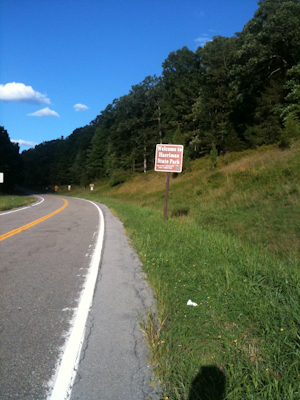 As it was, there was no problem with the route though I was questioning the detour 6 miles from the end. The detour turned out to be part of the route. During the daylight hours, I tend to read the cue sheet to see where the next turn is. This time around, I forgot the helmet light so was doubly pleased there was no issue with the GPS. Fellow riders. I think there were about 20 riders starting the 300k. Two riders made it through the first set of lights before they turned red so we were split in Englewood. Some of the early hills split the pack too and very soon, there were about ten riders in the second group. I grazed a serious pot hole and was thankful my front wheel didn’t slam down on it. There had been no shout from the front riders. Five miles from the first control, I got separated from the group as my standard road gears took there toll and I had to grind out the climbs in the lowest gear that didn’t allow me to spin much. For pretty much the rest of the ride, I was riding solo though I did keep switching positions with a few other riders as I caught them on the hills and they moved away from me on the flats. Hills. I found them tough. I know that next year I will be riding tougher hills so I need to get some training in somehow over winter. The dreaded three mile climb up to Guymard Lake was not as bad as I was expecting; I think climbing the bridge over the railway line was the toughest part of it. The climb through Harriman State Park felt longer and it was with great satisfaction that I reached the descent from that. The gravelly road with only car tracks as the clear places kept me alert as I whizzed down at speeds over 35mph. By the end of the ride, I was thinking of forming a More Tunnels movement on FaceBook so there is little need of hill training. I definitely need to do something with my gears before next year. Gear. My gear stood up. It was dry so I did not have the problem of what happens when the cache battery gets wet. I really need to address the possible issue of the frame bag getting wet. Cables coming into the bag from the outside will bring water into the bag. During the night, the GPS runs off the cache battery and when that runs out of juice, the GPS has its own internal battery which I know lasts about 12 to 13 hours. During the day, the cache battery gets charged and the the GPS unit gets charged as a result. It is a good system and stops the front light from flashing when both systems are demanding power from the hub. The only problem will be rain. I also need to get a longer stem to allow the light to shine more horizontally rather than the acute angle which it currently faces. The longer stem will allow the GPS and light to sit one in front of the other without touching. Water carrying needs to be addressed also. We had two 50 mile sections and I ran out of liquid for the second one. I stopped at a deli on the first one to replenish liquids. If it had been hotter, then I would have ran out of liquid earlier. So either a bigger camelbak or find a way to carry more water bottles on the bike itself. The ride. It was a very picturesque ride. 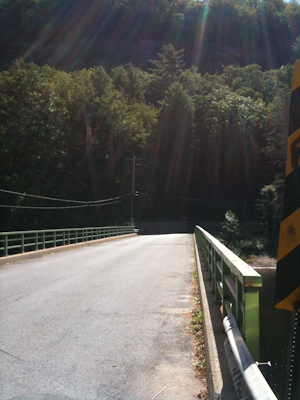 Unlike the flatter NJ rides which took us to the southern part of the state, this ride kept us north and into NY. No part felt desolate as the 400k and 600k had felt at times. The first section done mainly in the dark and after 33 miles or so, I started feeling the effects of the hills. At the first rest stop, Laurent said the second section was the toughest and the climb on the third section was the worst of the ride. He was right. The second section was up and down most the way and the climbs were the steepest. However, the finish of the second was a long descent which made all the climbing all worthwhile. After the climb to Guymard Lake, the remainder of that section was recovery until just before the rest stop when there was another climb. The fourth section took me by surprise as I was not expecting another 50 mile stint. I knew there was a information controle but hadn’t looked to see the mileage to the last rest stop. The good news about that was that there was only 22 miles remaining after the rest stop. Harriman State Park was longer than I expected; have I written that already? I was half expecting to see a bear but none materialized. I did see two deer on separate occasions. I saw a Dunkin’ Donuts on the way down from Harriman SP but as I was flying by it at some speed, I forgot to stop to replenish drinks. By the time I had worked it out, I had already gone some distance and hoped I would pass another place to buy liquid. I didn’t but thankfully made it to the rest stop with one mouthful of water left in the water bottle. I didn’t want to totally finish it. It was dark by the time I started the final section. I left at 8 o’clock and had four hours to do 22 miles. It was relatively flat in comparison to the rest of the ride and when I got on to 9W, it felt familiar as I had cycled there many times when training for the NYC century ride back in 2005. I had not done it at night so that was different but it was a road I knew. We came into civilization properly once we hit Nyack and then it was semi-surburban roads for the rest of the way. A short detour four miles from Englewood had me cursing one final time as the detour involved climbing a couple of short inclines. Then it was back in Englewood and finally back to the hotel. I reached the hotel before 10pm – over two hours to spare. I think that was the closest run of all the brevets. A most enjoyable ride. Tough but very much worth the while. A great thanks to all the volunteers and to Leroy and Laurent.